The wonderful citrus aromas of this brewed green tea and tingling, fresh lemon peel complement one another perfectly. Brand new GREEN TEA LEMON: We started with a tea base of a light Sencha Green Tea from China, the addition of lemon peel & natural lemon flavour gives this tea the refreshing aroma and flavour of real citrus lemon, with a delightfully sherberty sweet mouth feel lifted by the freshness of the lemon. Not too dry or too citrusy, a great all rounder! We think it's a beautiful pairing and the reason it took us so long to launch our own, was down to the flavour of the lemon, we knew we wanted a natural, fresh lemon taste from the brewed tea and we have got it now! The naturally occurring antioxidants in green tea are also boosted with the addition of lemon, which is full of important nutrients, definitely worth making one swap and enjoying one cup of green tea per day. This is a zesty, refreshing green tea. It's a great cuppa to enjoy at anytime of the day! 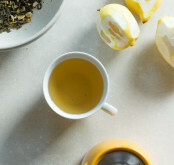 Brew 2-3g of green tea lemon with 200ml of water at a temperature between 75 and 80 degrees and leave to infuse for 3 to 4 minutes. 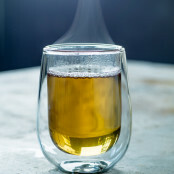 For anyone who finds green tea to be an acquired taste, temperature and brewing time are very important. Off the boil, or boiled then a dash of cold water added, brewing time should be up to but no longer than 5 minutes, we find 3 minutes to be perfect. Easy to use website, very prompt service and nice choice of lovely tea. Product : Light and refreshing change during the day. Service rating : Amazing tea, arrives super quickly! Product : So glad they’ve started making this tea, I love green and lemon and this one is great. Product : Very Happy with this tea, would love if it came in teabag form as could bring to work.